Perhaps you are hanging on to an older vehicle for sentimental reasons or maybe you do so to save money on car payments. Whatever the case, if you have an older vehicle with high mileage, you will need to take extra good care of the vehicle to ensure it stays on the road without any major repairs. Here at Urban Auto Care, our trusted Denver mechanics can help you keep your older vehicle operating smoothly and efficiently. With years of experience in the industry, we know how to best take care of older vehicles to help prevent costly repairs. Check out these tips for caring for older vehicles. When it comes to taking care of an older vehicle, there are a few things you should make sure you always do. One of these items on your list should be frequent oil changes. As your vehicle gets older, the oil will play an increasingly important role in ensuring your engine is operating smoothly. Skipping an oil change on an older vehicle can easily lead to serious engine failure. Talk to your mechanic about how frequently your vehicle needs an oil change and whether or not it is worth investing in a high-mileage oil for your car. By keeping your engine properly lubricated and getting rid of any gunky oil on a frequent basis, you can ensure a longer lifespan for the engine. Another important component to keeping your older vehicle on the road is to ensure that the cooling system is operating properly. Keep your coolant topped off and ensure you flush the system as needed. If you haven’t had any of your coolant hoses replaced recently, it might be worth inspecting them for cracks or holes. Even if your car doesn’t have high mileage, if it is getting up there in years, anything rubber will start to deteriorate. Have your mechanic look over all rubber hoses to ensure your coolant system continues to do its job. As your car gets older, make sure you are paying attention to any warning signs of trouble. From weird noises to leaking fluids, take any symptom seriously and have it looked at right away. The sooner you can catch issues with an older vehicle the better, as unattended damages will only worsen. By replacing parts before they completely fail, you can prevent a roadside breakdown. At the first sign of trouble, stop by your auto repair shop and schedule an inspection. While you might be able to handle a lot of simple maintenance and repairs on a newer vehicle on your own, skip the Do-It-Yourself route with older cars. Just as a human needs more specialized care as they age, so does an older vehicle. Make sure that you reach out to a professional for help maintaining and repairing your older car. They will be best equipped to handle major repairs and can help warn you of impending problems. Here at Urban Auto Care, we are proud to provide high-quality auto repair services, even for older vehicles. You can trust our Denver mechanics to help you keep your car on the road for as long as possible. 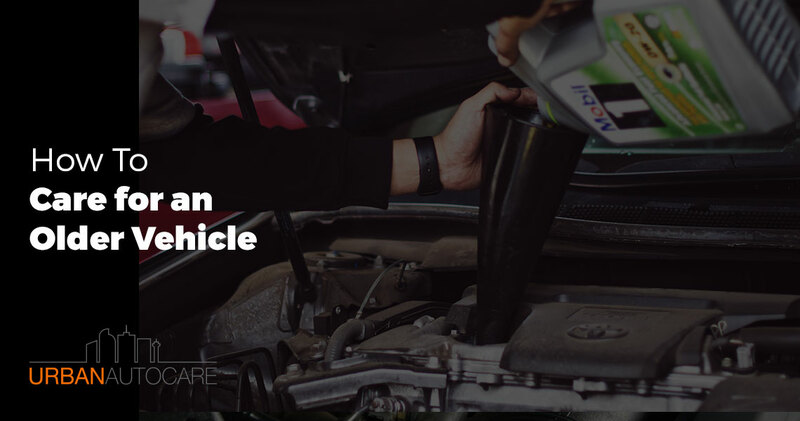 Whether your high-mileage vehicle is a bit of a collector’s item or it is simply your daily commuter, we are equipped to ensure that every component operates smoothly and effectively, preventing major roadside breakdowns. Talk to us today about what maintenance will be important for your specific make, model, and year, as well as to schedule any major repairs before they lead to a more costly scenario.